Makki atte ka halwa with step by step photos. Winter is here and makki atta is in this season! This halwa is a must try. It is very tasty and easy to prepare. I have used very less ghee. You can increase the amount of ghee. Obviously it will enhance the flavour. For preparing makki atte ka halwa, we should roast makki atta very well in ghee. Once it becomes fragrant add milk and ensure that there are no lumps. Towards the end add sugar, chopped dry fruits and crushed cardamom. Easy! Isn't it? 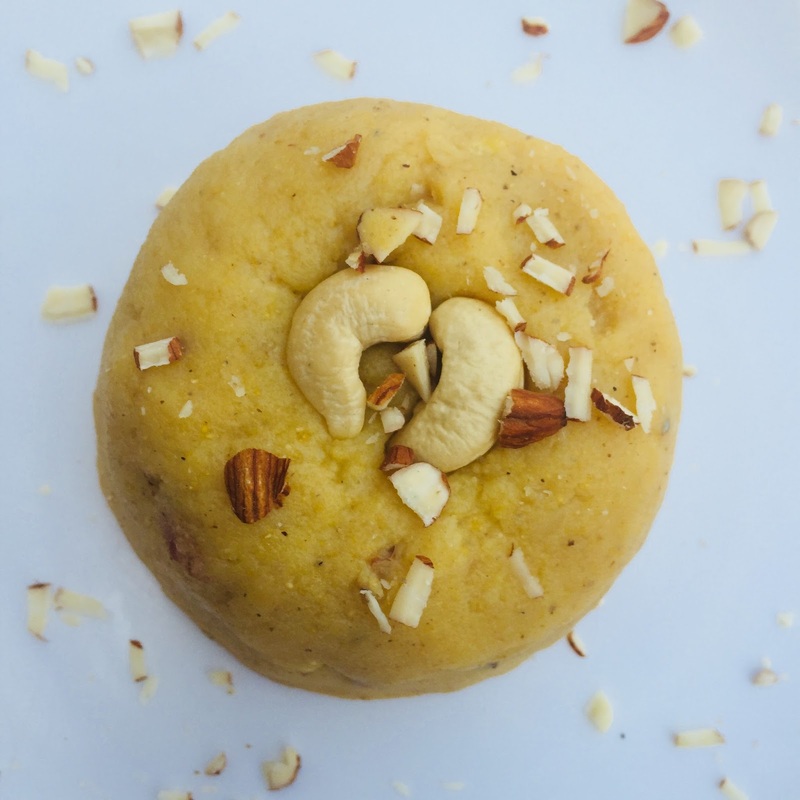 Here goes the detailed Makki atte ka halwa with step by step photos. Heat ghee in a non stick kadhai. It is important to use non stick kadhai here otherwise you will end up using double amount of ghee. Add makki ka atta. Roast it on low flame for sometime until it becomes fragrant and a little dark in colour. Time to add milk. Don't add all the milk at once. Add little then mix it. Keep on doing this. This will ensure that there are no lumps. Add sugar and mix it well. You can add a little ghee at this stage too. It is optional. Add all the chopped dry fruits. Halwa is ready to be served. 2. Add makki ka atta. 3. Roast it well on low flame until it becomes dark in colour and becomes fragrant. 4. Add milk slowly and stir it continuously. Ensure that there are no lumps. 6. Add chopped dry fruits. 8. Makki atte ka halwa is ready! Makki atte ka halwa is ready! Amount of ghee can be increased. I have used non stick kadhai which helped me in using less ghee. Adding more ghee will definitely enhance the flavour. Amount of sugar can also be adjusted as per your taste. Make sure that there are no lumps while adding milk. Best way to do this is to add milk slowly and stir it continuously. Do try this recipe at home and if you like this recipe then don't forget to share with your friends and family.